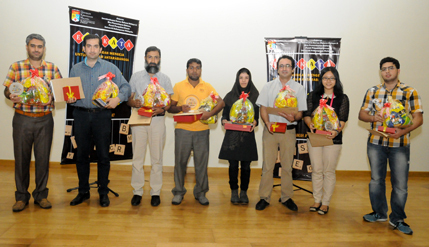 BANGI, 24 April 2014 – An Iranian and a Sri Lankan won The National University of Malaysia (UKM), Bahasa Melayu Spelling Competition organised for the university’s post graduate students. Teherah Jafari doing her post graduate studies at the Fuel Cell Institute and R.A. Sarjoon studying at the Faculty of Islamic Studies (FPI) won the competition organised by the university’s Centre of General Studies (PPU) for its international students taking up Malay as part of their programme. A total of 16 post graduate students took part in the competition “Ejakata” held at the Centre of Graduate Management (PPS) Hall. PPU Director Prof Dr Khairul Anwar Mastor applauded the PPU team for organising the competition and the international students for taking part. It was the first time such a competition was held. “Teaching Bahasa Melayu to the international students will help spread the reach of the language by giving it international exposure,” Prof Khairul said hoping that it will be made an annual event. He later presented trophies to the winners and certificates to all the participants.